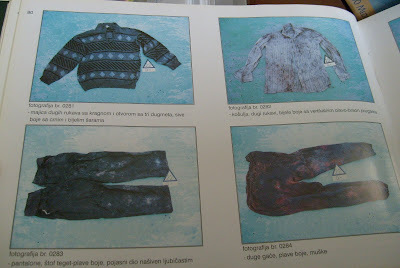 Personal clothing items exhumed from the Srebrenica genocide mass graves. Photo by Laila Zulkaphil, the Advocay Project Fellow. A young Advocacy Project (AP) Fellow, Laila Zulkaphil, recently spent time in the morgue containing the remains of the Srebrenica victims in Tuzla. Bosnia is a global leader in the science of DNA. We're proud of Laila for her speaking the truth and raising an awareness about the Srebrenica genocide. Laila makes a number of important observations in her latest post, entitled "Working with Dead People is Easy." "I had seen photos of the ICMP morgue many times before, but being there myself and standing in front of those 1,500 individuals – once sons, brothers, and husbands but now mere bones lying on the cold shelves of a morgue – was nothing like looking at pictures. The feeling was indescribable," she wrote on her blog. She has also updated us on the number of identified victims scheduled to be given proper burial on the 15th Anniversary of the Srebrenica genocide in July next month. "ICMP has so far identified 732 persons since July 11 of last year and expects that the number may reach up to 750 by the 15th anniversary of the Srebrenica massacre. This is the largest number of persons to be buried at the Srebrenica-Potočari Memorial at once. We know that 6,000 persons have already been identified and buried, and another 1,500 persons are awaiting identification in the ICMP morgue in Tuzla. Still more mass graves are found around Srebrenica almost every year, and local authorities are exhuming another one at this moment. This easy math makes me think that even 8,000 is too small a number." Laila correctly observed on her blog that the Bosnian Serb attempts to deny Srebrenica genocide are futile. "These numbers also disprove the Bosnian Serb explanation of the Srebrenica massacre. Serbs have argued that persons found in these mass graves are not victims of a single massacre, but were brought from different parts of Bosnia during the war and buried around Srebrenica to make it look like a serious mass crime had taken place. The fact is that people from Srebrenica and the nearby towns reported their missing relatives after July 1995, and these missing individuals have been identified with more than 99% accuracy using DNA samples." Laila also discussed the traumatic challenges that Srebrenica victims and their relatives face on an ongoing basis. "Perhaps the biggest challenge is that it is extremely rare to find the Srebrenica victims’ whole bodies. The Bosnian Serb Army dug up the primary mass graves and reburied the bodies in secondary and tertiary mass graves in order to conceal the extent of the crimes they had committed.... Due to this challenge, many people decide to bury the partial bodies of their relatives. However, ICMP has found the remnants of 500 persons already buried at the Srebrenica-Potočari Memorial. Some families decided to re-exhume the graves of their relatives to add the remaining body parts..."
To read Laila's entire post and view photos from the morgue, please visit her AP blog at this link.